Should be fairly self-explanatory on how to use but just in case its needed the help section can be toggled by right-clicking the 'preview' area. TyreTire v0.7 is now completely FREE...Merry Christmas! Yes, the trial period has been removed so its even more user friendly than ever. If you've had problems getting the script to run before, please try v0.7. Fixed Map Dir Missing error. Tried to add profile scaling option when rim radius changed but failed on all accounts. If anyone knows how to scale the 'custom' shape of a sweep modifier via mxs with the same effect as manually scaling the spline sub-object of the profile..... and would care to share then I'll add it in.....meantime, I'm all out of ideas. Fixed height issue when changing 'tread depth' spinner. Limited 'Rim Radius' spinner to zero or positive values only. Fixed spinner 'Type in' method, should now work ok. Slight change to 'Help' menu text. Added error checking, now outputs to listener. Fixed custom spline orientation bug. Fixed profile movement when rim diameter changed. Last used custom profile / map should now be retained. Spinners now disabled until a tyre has been created. Swapped UI around for a more logical workflow. Now checks for VRay installation. Minor tweaks. Corrected 'help' error. 1: Custom 'profile' splines should to be created in the TOP viewport and in a CCW direction......ie, with vertex 1 on the right. This should keep the normals facing outward. You can edit the profile created by the script anyway which may be an easier option. 2: The image folder needs to stay with the script file for the script to load. Submitted by bugmenot on Sun, 2016-09-18 00:19. It's so sad that Vray is required for this awsome script. It would have been so nice if it worked directly with the scanline renderer or with MentalRay. Submitted by CJCA915 on Sat, 2014-12-06 19:54. Looks like a nice script, unfortunately, I don't have VRay. I'm a finalRender guy myself. Submitted by jackbear9 on Mon, 2014-09-22 15:27. Can you provide me with a link to the correct V-Ray. I have tried and kept getting the error. Submitted by Nessus on Tue, 2014-07-22 09:22.
can anyone help me solve this issue my email address is [email protected]. Did my license expire? If so, how do I renew it? Submitted by MrTom on Sat, 2013-09-28 11:40. Well the line has to be drawn somewhere otherwise I'd spend all my time creating every conceivable combination of profile / map possible. The 'custom' pre-set is there for you to use your own profile and / or map. You can even use one of the pre-set profiles with your own map...or your own profile with a pre-set map.....etc etc. The whole script is only meant to give you a 'head start' when doing this type of modelling by automating the 'common' tasks and allowing a small amount of variation within them. Submitted by jastamos on Sat, 2013-09-28 06:37. 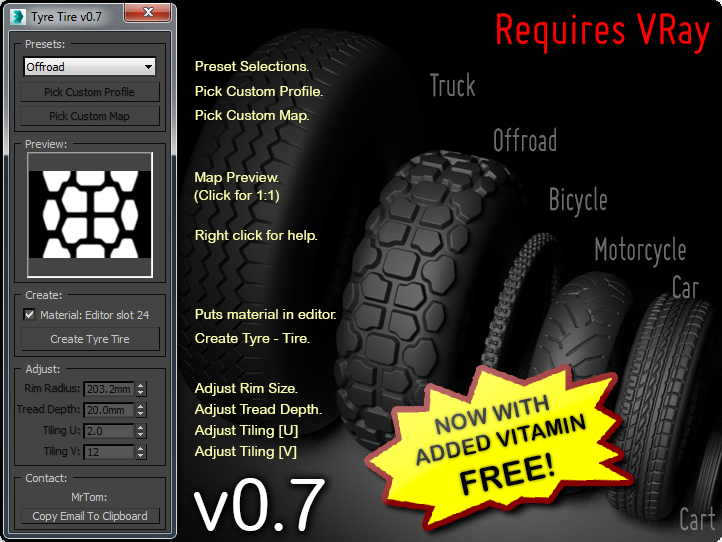 What about motorcycle off-road (trial and motocross) presets? Submitted by barigazy on Fri, 2013-09-27 15:44. Submitted by MrTom on Fri, 2013-09-27 10:47. I don't, and never have, used mental ray, been a VRay person from day 1.....many moons ago. If I get "this" version good enough to release, and if people are interested then sure, I'll add in mental ray support. I've had e-mails from [potential] users stating the script doesn't work only to read in their listener output that VRay isn't even installed so maybe the need for mental ray support is already there? I dunno. Anyways, thanks for the script snippet.....that was exactly the way I was going with this.....only not quite so elegant.....it still amazes me that the code you need for something is never the code stated in the mxs docs, but some other 'variation' of it....which is NOT in the mxs docs! Its a wonder anyone ever codes anything really! I'll start a forum thread. Submitted by MrTom on Fri, 2013-09-27 10:26. This is just a temporary error, probably caused by the way I've coded the script, doh! Just run the script again, it should work.....hopefully clearing itself in the process. If you continue to receive errors of this nature then I'll look into it further, but running the script a second (or maybe a third) time should be enough. Submitted by onnavitsu on Wed, 2013-09-25 20:26.